Lay a paper towel down where you’ll be painting in case there are any drips or spills. Before you begin, make sure your cuticles are pushed back to allow a smooth flat surface to paint on and that your nails are clean. Use a paper plate to put a very small amount of the polish on. Add colors to the plate as you need them. It dries quickly so when it does, add more. With the paint on a palette/plate you can control the amount of paint on your dotter better than dipping it in a bottle. When you want to change colors, wipe your dotter off on the paper towel first, then if needed, clean it in the nail polish remover. You can use a nail or blow dryer to speed along the drying process. You may also want to use reading glasses to magnify your view. Pay attention to how much paint is on your dotter. A lot of paint makes the dot bigger and less makes it smaller. 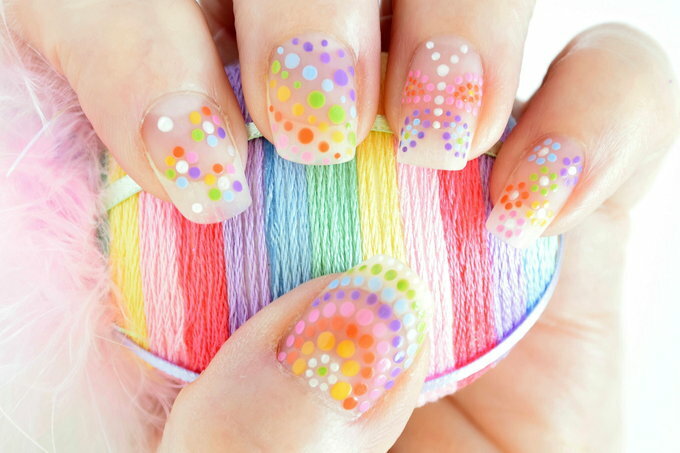 If you barely touch your dotter to the nail it makes a smaller dot. If you press all the way down it makes a bigger dot. If a nail doesn’t work out, take it off and redo it. Use a fine tipped tweezer to scrape off a dot or two if they aren’t in the right place. Use a paintbrush to replace the matte layer before you repaint. You’ll get better and better at using the dotters the more you do it. If your nails aren’t this long, adapt the design to have less. Work on one nail at a time. When you’re all done, look at the dots and see if any have paint that went on too thinly. If so, put a second dot on top. Paint all of the nails with the Transforming Effects Matte Top Coat using the bottle’s brush. This gives it a foggy look (like an acrylic nail) and a faint white background. Let it dry completely. To make an arch nail, use a small dotter to put one green dot in the center of your thumb a little ways away from the cuticle. Put 6-7 white small dots around it to make a flower. Going from the cuticle around the flower and back to the cuticle, use a larger dot tool to make an arch with about 6 larger dots. Continue going around that same arch with successive dots along the rainbow of colors. But make each arch different sized dots. 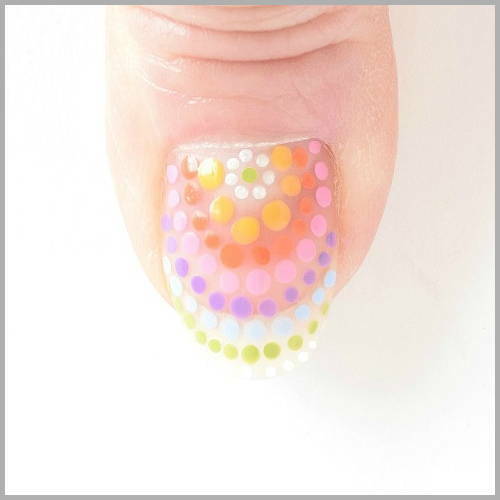 You could use large to small to large or have the dots get successively smaller until you run out of nail. 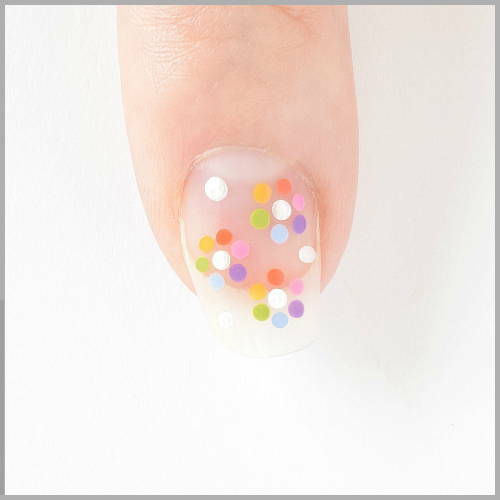 To make a flowers and dots nail, put 3 white small dots at equal distances on the nail. Use the small dotter to paint one purple dot outside each of the white dots. It can be in the same location for all three flowers or at different locations. Continue putting the rest of the colors around the 3 main dots. If you get too close to the center dot the petals might not all fit so leave a little space. In the empty areas on the nail put 3 different sized white dots. To make a diagonal nail, put green dots in a diagonal line across the middle of the nail. The dots should vary in size along that line. Make the other diagonal lines of dots outward from the green. If you have open spaces at either end, fill it in with the closest color. I recommend you practice dotting this one on paper first – because it is the hardest. I used my smallest dotter for all of these dots. With white, make a V down from the cuticle in the center of the nail. Make the connecting point on the V a little larger so it looks like a head. Then dot 4 white dots straight down the nail to make the body. 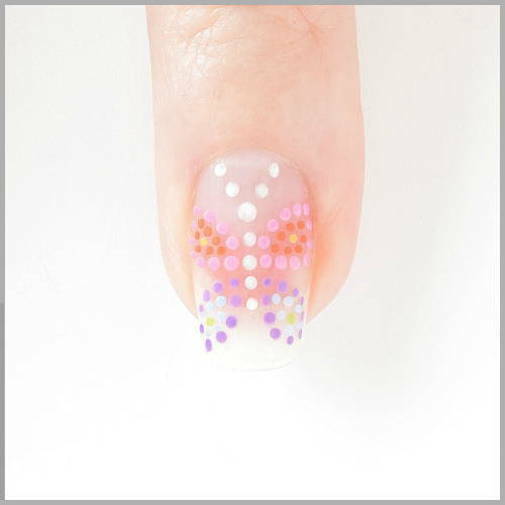 With pink, make 2 dots on each side of the upper 2 white body dots. From the bottom pink dot go outward making pink dots toward the sides, then up, and then back to the upper pink dot to outline the wing. Do this for both wings. Go around the inside of the pink wings with an outline of orange dots and then one final yellow dot in the empty space. For the lower wings, put 2 purple dots along the 2 bottom white body dots on each side. From there make an oval or teardrop shape of purple dots. Go around the inside of the purple wings with an outline of blue dots and then one green dot in the empty space. 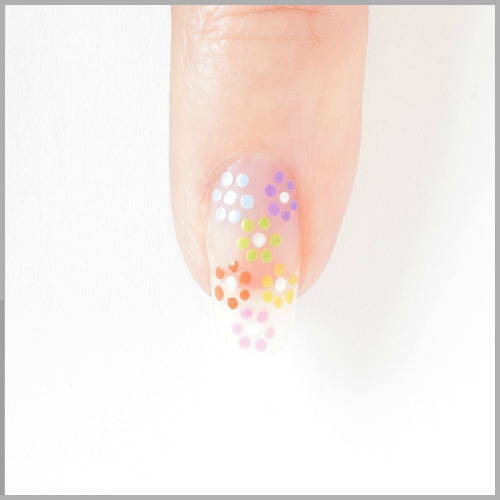 To make the small flowers nail, use the smallest dotter to make 6 white dots equally spaced on the nail. Make about 6 small dots of each color around the white dots. Don’t get too close to the white dot or they might not all fit. You can use a clear top coat. But I didn’t. I wanted the brightness of the colors to stand out.